Product #3849 | SKU SM137 | 0.0 (no ratings yet) Thanks for your rating! 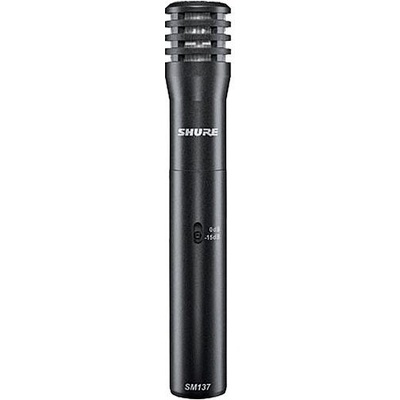 The SM137 Cardioid Condenser Microphone from Shure is a small-diaphragm microphone that is well suited for instrument and vocal capturing in project recording and sound reinforcement situations. The SM137 features an ultra-thin diaphragm that yields a smooth high-end frequency response with a tight, controlled low-end. A -15 dB Pad switch minimises distortion caused by transient (peaking) audio signals. The microphone's cardioid polar pattern effectively eliminates noise and feedback at the off-axis sections of the capsule. Whether miking amplifier cabinets, drums, percussion or vocals, the SM137 is sure to be a modestly priced solution for the studio or the road.